Buy any ONE (1) package of Rhodes® Warm-N-Serv Rolls, Save 50¢. Expires 2/10/2012. One time use only. Buy any 1 Sundown Naturals® product, Save $1.00. Expires 2/8/2012. One time use only. Buy 3 Kellogg's® Eggo® Waffles (6 ct. or Larger, Any Flavor, Mix or Match), Save $1.00. Expires 2/1/2012. One time use only. Buy 2 Keebler® and/or Sunshine® Crackers (8 oz. 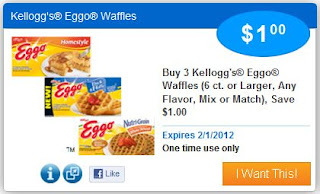 or Larger, Any Flavor, Mix or Match), Save $1.00. Expires 2/1/2012. One time use only. Buy any TWO (2) cans of Red Gold Tomatoes 10 oz. or larger, Save 75¢. Expires 2/1/2012. One time use only. Buy any 1 Trop50® 59 oz. flavor, Save 50¢. Expires 1/25/2012. One time use only.